G3 Residences, the 155-home condo development under construction in Surrey’s Guilford neighbourhood, has proven popular with buyers thanks in part to its affordable price tag (from $139,900) and amenity-packed neighbourhood. In fact, the project’s second phase is already more than 50 per cent sold — a number that is sure to increase quickly now that G3 Developments is offering major discounts on the remaining homes. Right now, studio apartments at G3 Residence are $3,000 below the original price, one-bedroom homes are $5,000 off, and two-bedroom units are $8,000 cheaper. And now that G3 Residences is less than a year from completion, banks are able to offer a lower interest rate and qualification is easier. 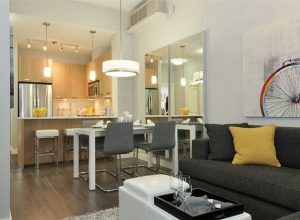 Stellar features at G3 Residences include nine-foot ceilings, stainless steel appliances, parking and storage. The building itself boasts a 2,650-square-foot shared amenity lounge and a private athletic facility. Those looking for convenience will appreciate the fact that G3 Residences is within walking distance of the Guildford Shopping Mall and the Guildford Recreation Centre, as well as plenty of parks, schools and other services. For more information call 604 588 8238, email info@g3living.ca or visit their website here.